Once you’ve mastered the rules for which electrons to resonate (video 2) it’s important to understand which resonance structures are considered important or major contributors, and which are considered less important or minor contributors. This video helps you rank resonance structures based on charge, electronegativity and more. 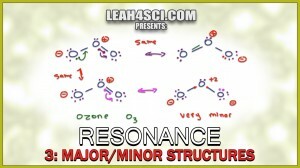 This is Video 3 in the Resonance Structures Video Series. Click HERE for the entire series.